In September of 2000, six individuals from northwest Iowa formed Quad County Corn Processors and signed an option to buy 102 acres of land south of Galva by Highway 20. Their group started fundraising to build an 18-million-gallon ethanol plant. In just six weeks’ time, over 420 Iowa farmers invested in this value-added project. A formal ground-breaking ceremony was held in December of 2000 on what would become the future site of Quad County Corn Processors. Construction continued during 2001 and early 2002. On February 26, 2002, the first load of ethanol was transported out of the plant by truck. Sixteen years later, QCCP employs 40 dedicated professionals who operate the plant 24 hours a day. In 2011, Quad County installed equipment to extract corn oil. In 2012, Quad County made a significant distillation upgrade which reduced natural gas usage and increased ethanol production. In 2013, Quad County opened a transload facility in Cherokee to ship ethanol by rail car. Quad’s rated capacity is 100,000 gallons of ethanol a day which translates into 35 million gallons per year. As part of the process, Quad also produces 750,000 gallons of corn oil on an annual basis. 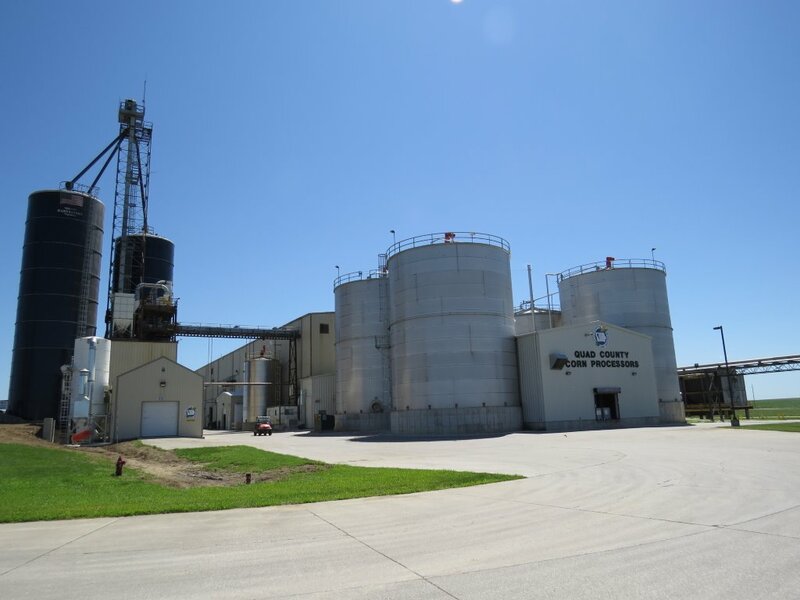 Quad County’s Research & Development Team has successfully developed a patented process for converting the corn kernel fiber into cellulosic ethanol, additional corn oil, and a high-protein, low-fiber feed. In addition, Quad County generates premium feed co-products. In 2012 alone, over 275,000 tons of these co-products were used in beef and swine rations. At full capacity, QCCP grinds 35,000 bushels of corn per day, or 12.5 million bushels of corn a year. The company has become a primary market for hundreds of Iowa grain producers.